Computer alert helps IT management to know what happen in the whole network and quickly locate the problem and ensure security within enterprise. Click menu Tools > Alert, then the Alert window will show with detailed alert information, including Alert Security, Time, Computer, Group, User, and Policy Type as the picture below. Real-time alert would display up to 500 records by default. Administrators can adjust the number of alerts will be displayed via Tools > Options > Real-time Alert > Alert Window. Alert information records real-time alert data, which means that if you turn off the console or re-logon to the console will automatically clear all records. 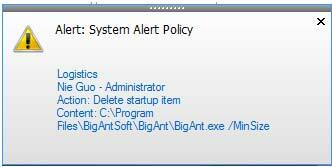 Administrators can query the alert information via Logs > Policy. Administrators can choose pop up alert bubbles when alert occurred via Tools > Options > Real-time Alert > Bubble Settings. Then alert information will pop up on the lower right corner of your computer as the picture below.